Rory Mario Trevor Sabbatini (born 2 April 1976) is a South African-born professional golfer. In 2019, Sabbatini changed his citizenship to Slovakia. 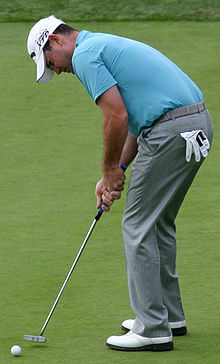 Sabbatini won six times on the PGA Tour between 2000 and 2011 and was runner-up in the 2007 Masters. He spent 21 weeks in the world top-10 in late-2007 and early-2008, with a high of 8th. Sabbatini was born in Durban, South Africa, and has Italian, Scottish and Irish ancestry. He started playing golf at age 4, but concentrated on it from age 12. He was recruited by the University of Arizona, turned professional in 1998 and joined the PGA Tour in 1999. He was the youngest member of the tour that year. During the first decade of the 2000s, Sabbatini had five PGA Tour wins; he finished 2006 placed 12th on the money list. In September 2007, he reached the top 10 of the world rankings for the first time, He spent 21 weeks in the top-10 between September 2007 and March 2008, with a high of 8th. Sabbatini tied for second at the 2007 Masters Tournament and the 2007 WGC-Bridgestone Invitational. He won the Par 3 Contest at the 2008 Masters Tournament. Sabbatini has represented South Africa in the World Cup five times and won the event with Trevor Immelman in 2003. In his first Presidents Cup appearance in 2007, Sabbatini had a 0–3–1 record, as the International team was defeated by the United States team. In May 2009 Sabbatini captured his fifth PGA Tour title by winning the HP Byron Nelson Championship by two strokes over Brian Davis. He broke the tournament record for scoring with a score of 269 (−19), beating the previous record of 270 (−18). In March 2011 Sabbatini won his sixth PGA Tour Title at The Honda Classic with a one stroke victory over South Korea's Y. E. Yang. Sabbatini entered the final round with a five stroke lead over the rest of the field, helped by a course record-equalling 64 on day two. He started his final round in solid fashion with an early birdie at the 3rd hole, however as the round progressed he made bogeys at the 9th and 14th, meaning that Yang was able to cut that lead to just one, with a spectacular tee shot on the par-three 15th that landed 18 inches past the pin. On the next hole though, Sabbatini holed a clutch birdie putt to tighten his grip on the title and played out the 17th and 18th in even-par to hold on for a one stroke victory. This win also secured him a place at the 2011 Masters Tournament. In the final round of the 2005 Booz Allen Classic, apparently frustrated by the slow pace of play by his partner, Ben Crane, Sabbatini finished the 17th hole and walked over to the next tee, leaving Crane behind to complete the hole by himself. He received heavy criticism, and some sympathy, and later apologised for the incident. Sabbatini also made waves following the Wachovia Championship in May 2007 when, after leading the field by one stroke after day three and then giving up five strokes to Tiger Woods to lose the tournament on Sunday, he proclaimed that Woods was "more beatable than ever." In the final round of the 2007 Bridgestone Invitational, he had a fan removed who heckled him with questions about Tiger Woods. Then, in December of the same year, more controversy was stirred when he withdrew from the Target World Challenge, an off-season event hosted by Tiger Woods, becoming the only player in history to withdraw from that event. In 2011, Sabbatini created more controversy when at the Northern Trust Open, after hitting his ball in the rough, a volunteer helped to locate the ball, but Sabbatini, thinking that the volunteer had moved his ball, yelled at him. He later apologised to avoid being penalised. Later in 2011, at the Zurich Classic of New Orleans, Sabbatini got into a heated, profanity-laced argument with playing partner Sean O'Hair for undisclosed reasons. His penalty was also undisclosed because of the PGA Tour's policy. In early 2019, Sabbatini changed his citizenship from South Africa to Slovakia, the home country of his wife and stepson. Sabbatini's wife's cousin is the vice president of the Slovak Golf Association. Initially, there was speculation that the move was made in order for Sabbatini to qualify for the 2020 Olympics, but he said it was to help grow the game in that country. The Olympics use the OWGR for qualification and the 201st-ranked Sabbatini would not have qualified for South Africa. Sabbatini also has a UK passport and US citizenship. ^ "Rory Sabbatini je slovenský občan (Rory Sabbatini is a Slovak citizen)" (in Slovak). 20 December 2018. Retrieved 20 April 2019. ^ "Rory Sabbatini now playing for Slovakia". USA Today. Retrieved 20 April 2019. ^ George, Dave (4 March 2011). "Commentary: Instigator Rory Sabbatini speaks loudly, carries a big shtick". The Palm Beach Post. Retrieved 26 July 2013. In a Golf Magazine article posted on Rory's personal website, this South African of Italian, Irish and Scottish ancestry refers to himself as Jekyll and Hyde – intense and aggressive on the course and easy-going everywhere else. ^ "Nation watches Sabbatini 'win' Par 3 Contest". ESPN. Associated Press. 10 April 2008. Retrieved 8 March 2011. ^ "Sabbatini Wins Byron Nelson After His Birdie on No. 16 Blunts a Late Charge". New York Times. Associated Press. 24 May 2009. Retrieved 26 May 2009. ^ "Sabbatini apologizes to Crane after snapping". ESPN. 14 June 2005. Retrieved 25 May 2009. ^ Hack, Damon (11 May 2007). "Sabbatini's Goal Is to Win Tournaments, Not Friends". The New York Times. Retrieved 25 May 2009. ^ "Sabbatini has fan kicked off course". Golf.com. Associated Press. 5 August 2007. Retrieved 21 June 2009. ^ "Agent: Last-place Sabbatini withdraws due to shin splints". ESPN. Associated Press. 16 December 2007. Retrieved 28 October 2013. ^ "Report: Rory Sabbatini in trouble". ESPN. Associated Press. 4 May 2011. Retrieved 28 October 2013.